I’m here to help you become fluent in the language you love + travel the world. 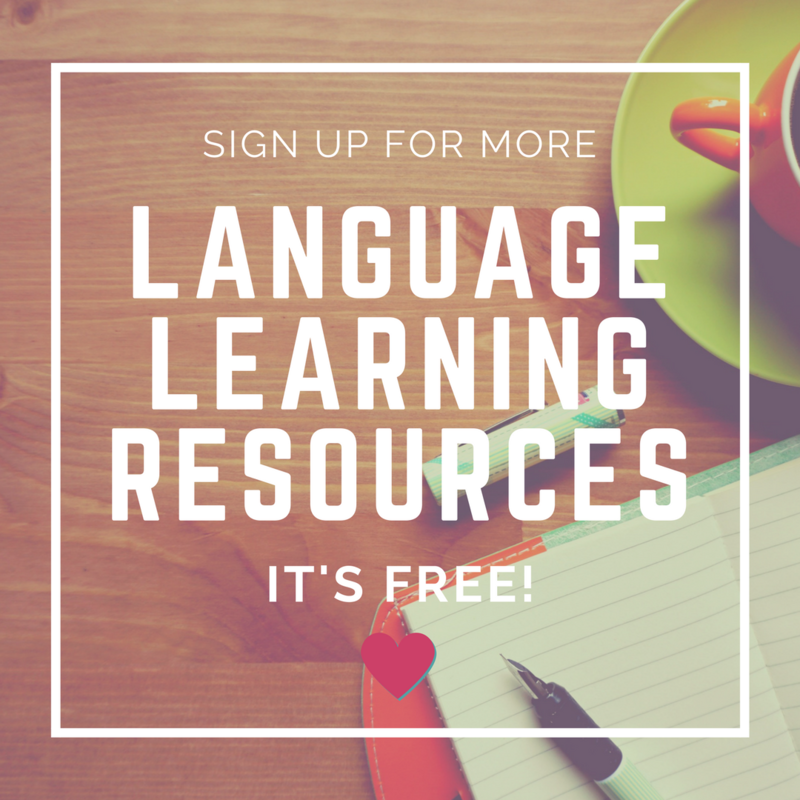 Here’s a collection of free resources that can get you started! Enjoy to the fullest! If you’re just starting learning a language on your own and don’t know where to start, here is a guide that help you get started. …And if you’ve started already learning but you can’t manage to be consistent, here are some free tips that help you stay consistent with your learning. 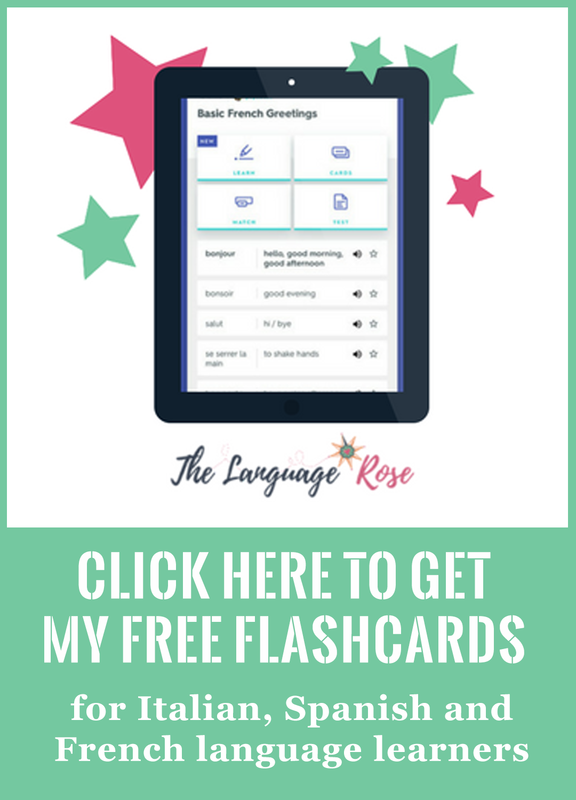 If you are learning Italian, Spanish, French or all three, I have over 300 language vocabulary flashcards organised into helpful topics that you can play with and download right here. 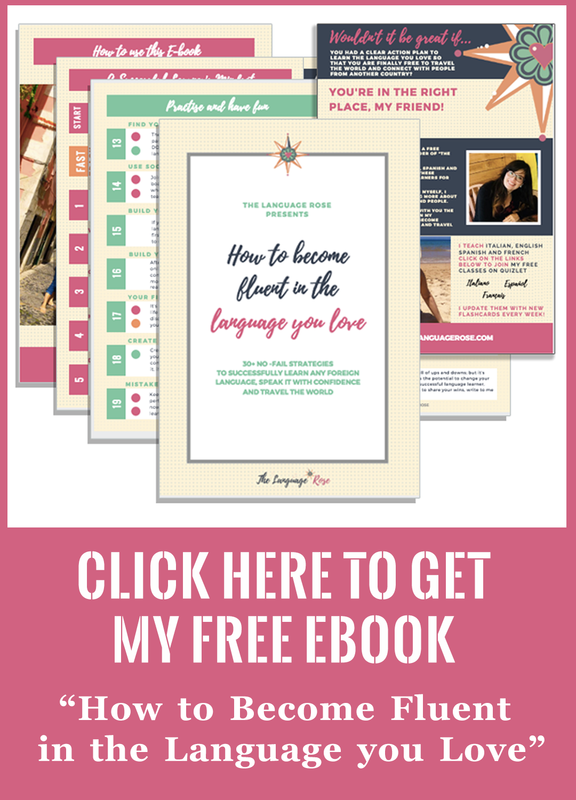 If you’re looking for no-fail strategies that help you become fluent in the language you love, you can download a free ebook right here where I share 30+ strategies that I used myself to become fluent in English, Spanish and French. …because – did you know? I’m actually Italian and I learned all my other languages just like you. Right here I share my personal learning story. If you’re struggling with speaking, here are some free tips that can help you. If you’re afraid of getting stuck in a conversation with a native speaker, here’s a checklist that can help you create a fun conversation script. If your fear of making mistakes is preventing you from speaking at all, here’s an article and another one that can help shift your mindset! If you don’t know where to start to learn Spanish, Italian or French, here’s a one page language learning resource list with free online resources that I personally use for my clients too. If you need some motivation to learn the language you love, here’s a learning sheet that can help you create your language learning mission statement + design your learning routine. If you’re looking for a language exchange partner or you’re struggling to find one,this article + its related learning sheet can point you in the right direction. If you’re struggling to find the time to learn the language you love, here are some free tips to help you learn a language even though you don’t have time for it. …And here’s a daily planner to make sure you block your learning time. If you’d like to learn a language more quickly and effectively, this article and this learning sheet help you find the right learning strategies for you. If you’re struggling with grammar, here is a step-by-step guide that can help you understand it better. If you’d like to have a conversation In Italian, Spanish or English to evaluate your level and also get some free strategies you can use on your own to get to the next level, here’s a link to book a free speaking session with me. Now, it’s over to you. Have you got a question for me concerning your language learning? Feel free to type it right here. Any language related topic is cool. Italian, Spanish, French, English, speaking, listening, reading, writing, art & culture, travelling, finding motivation, dealing with challenges, learning strategies, even teaching if you’re a teacher like me… whatever’s on your mind! I can’t wait to read and answer it!